You can make a calendar available for multiple projects by using the Organizer in Project 2013; it serves as the control center for custom items such as calendars you create in your project files. 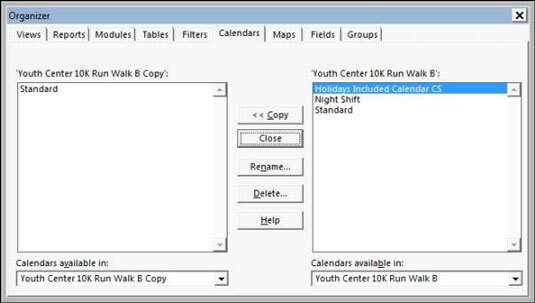 Using the Organizer, you can copy a custom calendar from one project file into another. You can copy a custom calendar into a template that provides default settings to every new project file you create. Open the project to which you want to copy a calendar and the project file that holds the custom calendar to copy. The Organizer dialog box appears. From the Calendars Available In drop-down list (in the lower-left corner), select the Project 2013 file that contains the calendar you want to copy. In the Calendars Available In drop-down list (in the lower-right corner), choose whether you want to make the calendar available in another open project (by selecting that project) or the Global template (by selecting Global.MPT). In the list on the left, click the calendar you want to copy and then click the Copy button. The calendar is copied to the current project. If you want to give the calendar a different name, make sure that it’s selected in the list, click the Rename button, type a new name in the Rename dialog box that appears, and then click the OK button. Close the Organizer by clicking the X (Close) button in the upper-right corner. Give the calendar a descriptive name. Providing an appropriate name helps you remember the calendar’s general parameters. If your company has standard calendars, have a single resource create and disseminate them. If ten versions of a management calendar float around and you grab the wrong one, it can cause problems. Add the project manager’s initials to every calendar template name you create. That way, you know which ones you created.